We are supposed to be back in Summerside but due to the very strong north wind, we didn’t make it. About an hour after we left, the wind really picked up. It was supposed to go to 20 knots but it hit 40 more than a few times, so we either had to turn around and go back to Wood Islands or tough it out until we got to Charlottetown. We decided to tough it out and once Dennis brought the boat closer to land, it wasn’t nearly as bad. The wind was wickedly cold though – coming from the north so we were happy to see the inner harbour at Charlottetown. The big event today while we were getting lots of sea action, was that there was a sudden crash down below. I went and checked and the mirror in the forward washroom had fallen right off and onto the floor. We were so lucky that it didn’t break! That is where we shower and I wouldn’t enjoy picking shards of glass out of my feet forever. You’ll see the pictures below of where the mirror is supposed to be and where it was placed today while under way. It’s funny that the mirror fell off when it did because when we arrived at the boat on Wednesday, the aft washroom mirror had fallen off sometime over the winter and was lying on the sink. Interesting that the glue lasted fifteen years. It didn’t break so I went to the fishing supply store in Souris and bought some powerful silicone to glue it on. I guess we’ll be doing that tonight to the forward washroom. Nothing much happened on the water today except for the mirror. There weren’t that many lobster pots to dodge so that made things easier. We did have a bit of trouble docking because of our instructions – the attendant told us that we would be docking on the starboard side and when we arrived, that wasn’t the case. We had to go back out of the marina and change the lines and fenders and come back in. So, I guess it is important to either make sure the dock attendant knows what he/she is doing or we need to rig both sides of the boat when coming into a strange harbour. Oh well, we just circled around once and Dennis was able to change everything to the port side. I walked over to the No Frills and got a few groceries while Dennis hiked over to the other marina to buy fuel for the boat. We might need it tomorrow if it is anything like today! The weather should be better tomorrow though and maybe we will get to put up a sail. Other than that, the only other funny thing was the “Harbour Hippo”. It is a cruise bus/boat in Charlottetown. After touring the city by land, the bus goes into the water and tours the harbour. When I saw it, it was playing the theme from Gilligan’s Island as it went into the water. I’m not sure it that would be my choice for a song but I guess it is better than the theme from the Titanic! That is all the news for today! Yesterday (July 4th), we decided to go to Charlottetown by car. It only took about an hour to get there unlike when we travel by boat which usually takes several days! We did a bit of shopping and then went down to the waterfront. 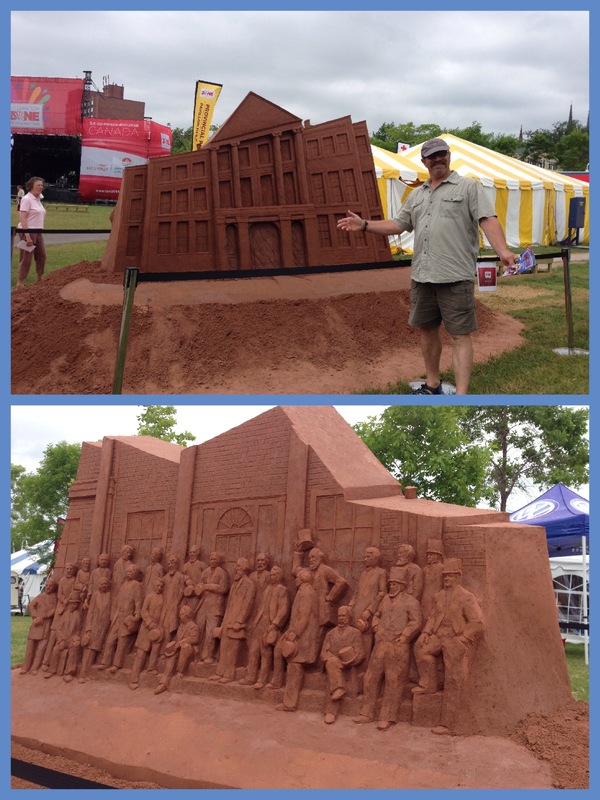 Charlottetown is really celebrating the 150th Charlottetown Conference. There is a pavilion right on the waterfront and all sorts of things to see. What really surprised us though were the free concerts. Every Thursday, Friday and Saturday during the summer, there will be concerts – Natalie McMaster played last night, Serena Ryder is playing next week, Burton Cummings, The Sheepdogs. We must have looked a bit confused – we were trying to pay to get into the pavilion and when the security guard talked to us about this, we were really surprised about the free concerts. We would like to take the boat there for the Burton Cummings concert on July 24th but we will see. Here is a link with the information. I took some pictures of the pavilion, the sand sculptures and of course of us being goofy tourists. Included in the second picture is Dennis with his old navy buddy and his Joy. They moved from Halifax to Montegue, PEI. David (nicknamed Zipper) was in the navy with Dennis many years ago. He and Joy moved to the island in June. They bought, as David describes it, a small blue house with a big red barn. He was right! David loves fixing cars and has a beautiful orange Mustang in the yard. We are supposed to go to the car show today but because of the weather, we may just hang around the boat. Today, we are waiting for Hurricane Arthur to land. The winds are starting to pick up but no rain yet. The marina has all sorts of extra lines on the docks and we do too. The wind is from the south-east which is a good direction because the break wall will take most of the pounding. 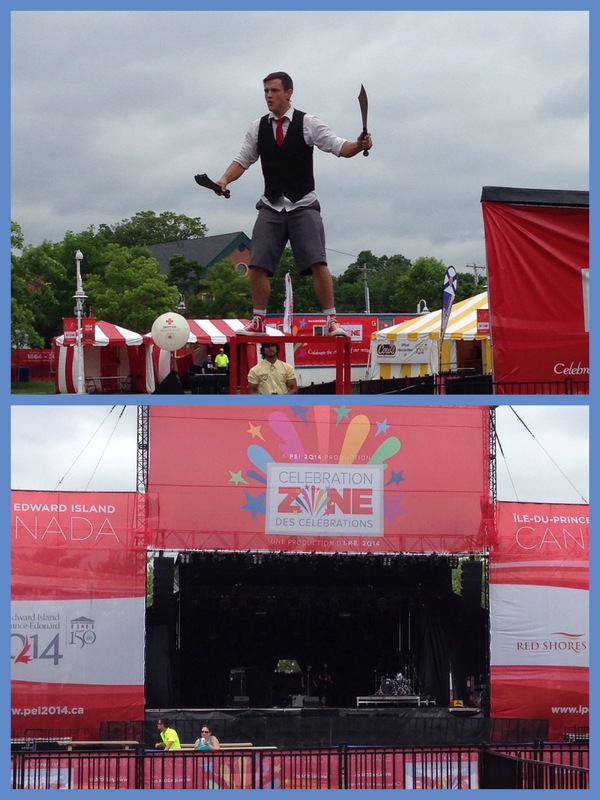 Here is a collage of the scene at 9:00 – not too bad yet! By the way, so far we have travelled 0.65 kilometres by boat – from the storage area to the water. We will eventually leave Souris – maybe Tuesday or Wednesday. 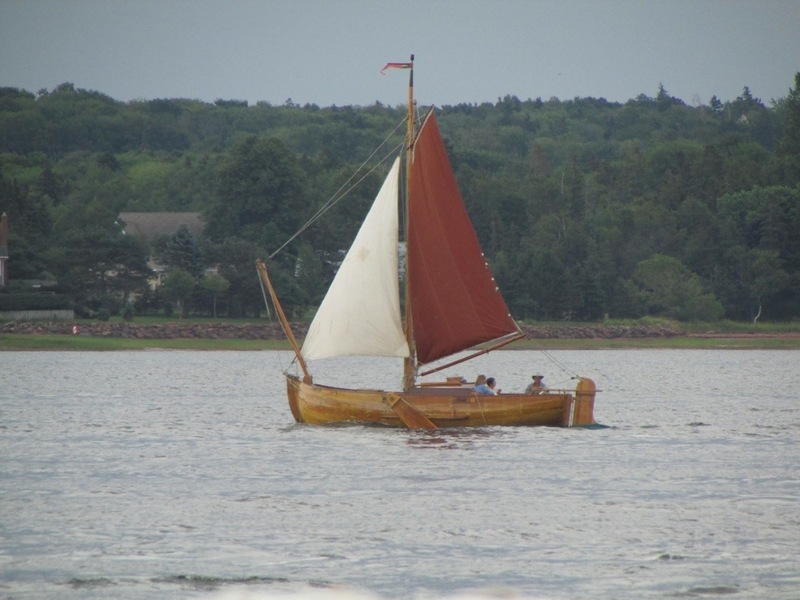 Dennis says the winds will be good for a sail to Pictou! 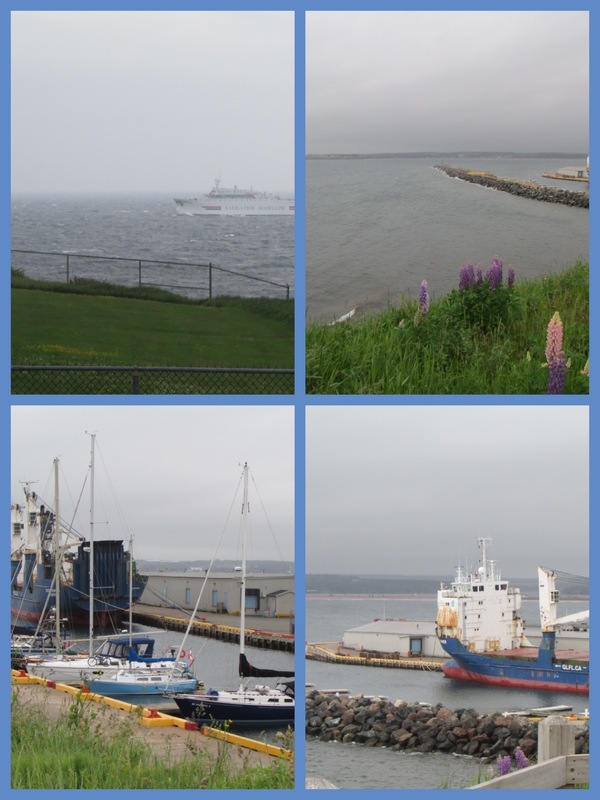 We left the ferry dock this morning at around 7:30 and made our way to Charlottetown. The wind was up quite a bit for a couple of hours so it was a bit rough until we pulled out the sails and then the wind died out (of course!). 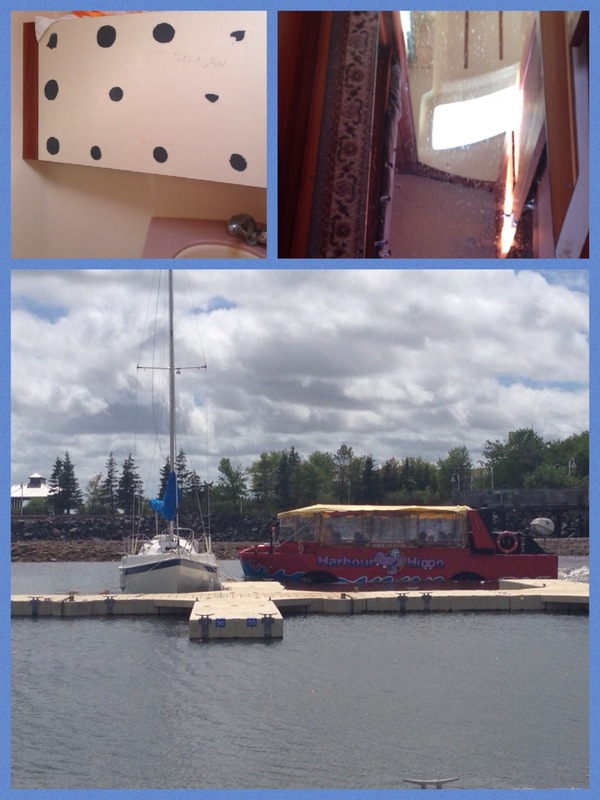 We arrived at the Charlottetown Yacht Club but didn’t really like our accommodations. The dock was made of cement and there were very few cleats to tie to, plus the giant yacht (Magic Days) had monopolized most of the available power. So we walked over to the next marina and asked if they had some room. They did and we moved the boat over to it. Charlottetown is quite pretty. Lots of old historical buildings – it is the birthplace of Confederation, after all, it should be interesting to explore. 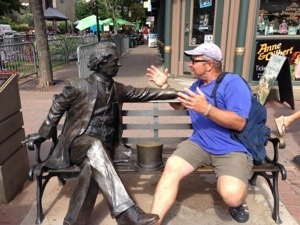 Dennis met up with Sir John A. 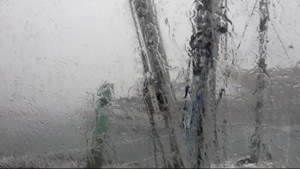 We made it back to the boat just in time for a sudden rainstorm to come through – winds were up to 37 knots so I am glad we are at the marina. There was an interesting boat sailing by before the storm. That is all the news for now. The storm has passed so I think it is time for supper. 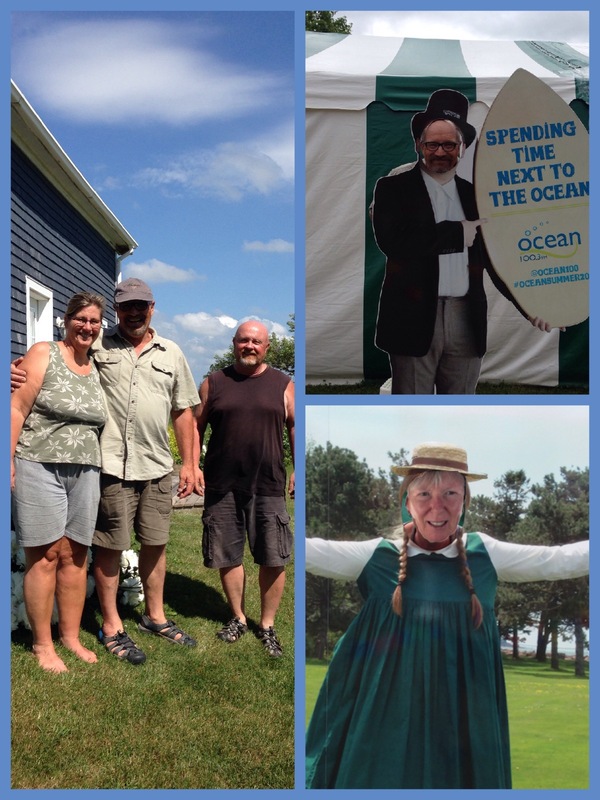 We are off to Pugwash next – probably on Monday or Tuesday.